Separation is the first anxiety most of us experience; infants feel it even when their parent is in the same room. Whether it be the first day of school, a breakup, or even a death, separation – and its upside, independence – is a ritual that repeats throughout our lives. 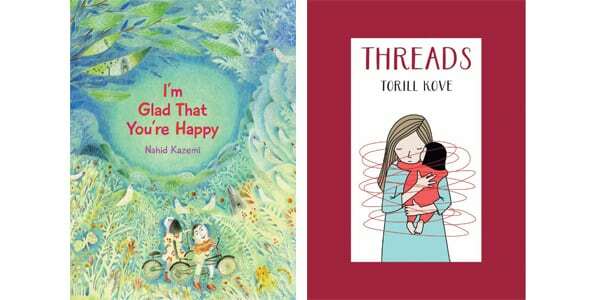 Two new picture books by foreign-born, Montreal-based author-illustrators take different visual and metaphoric approaches to the topic, but share the message that separation need not mean severance – that the ties that bind us remain even when they no longer feel tangible. Nahid Kazemi’s I’m Glad That You’re Happy begins at a flower shop. As Mr. Florist puts two plants together in a pot, he urges the larger one to take care of its smaller, weaker pot-mate. The plant duo flourishes and is eventually bought by an artist, who takes it home to be a subject for his still lifes. Now apart, but still visible to each other across the artist’s dining room, the two plants thrive – while bearing witness to various family joys and tragedies – and dream of the day they will be planted in the garden, where the painter promises they will grow into huge trees. Originally from Iran and the author of more than 60 children’s books, Kazemi dedicates this one “To all the parents who are best friends to their kids.” This suggests the plants represent the parent-child relationship, though two living things growing in the same vessel with shared roots might better suggest siblings, or even friends. (Biology class also teaches that different plants compete for resources rather than nurture each other.) But no matter. The implied sentiment – that to thrive we all need space to spread our roots, wings, or limbs, whichever the case may be – is well understood, even if the analogy doesn’t exactly fit. That same looseness does work when it comes to Kazemi’s charming, Chagall-inspired illustrations, with their flattened aspect, leaping, soft-limbed people and animals, anthropomorphized plants, and gentle blue-green palette. Norway-born Kove, an Academy Award–winning animator, expands this simple but effective metaphor. When a thread looks special, she posits, we grab it excitedly to see where it will lead us, even as the threads of family keep us tied to the ground. The book’s central characters are a mother and young daughter bound by a red thread; when they embrace, it spirals, cocoon-like, around them. As the girl enters the trials of adolescence, however, the thread expands and contracts, like a yo-yo. One of Kove’s most touching images shows the grown daughter and mother wearing their bunched threads over their hearts, like brooches: “The love we have for each other will always stay in our hearts, even as you find your own way.” The story ends where it began, with the young woman glancing back at her mother as she prepares to join the line of those waiting to grab a thread of opportunity. If Canada has a classic picture book on the parent-child bond, it is Robert Munsch’s Love You Forever. Both Kazemi’s and Kove’s tread similar territory but without Love You Forever’s cloying and infantilizing tone. Consider them imaginative, wonderful alternatives.